The last chapter in this series is going to cover how to use citations on other review sites to help improve your Google Local rankings as well as tracking these rankings to keep on top of your influence online. 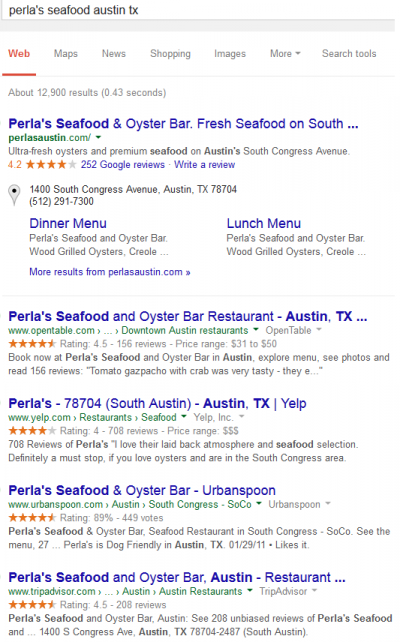 If you remember from the previous chapters, there was an image of the SERPs for seafood in Austin, Texas that not only included the local listing results but the organic results also featured review sites like Yelp. 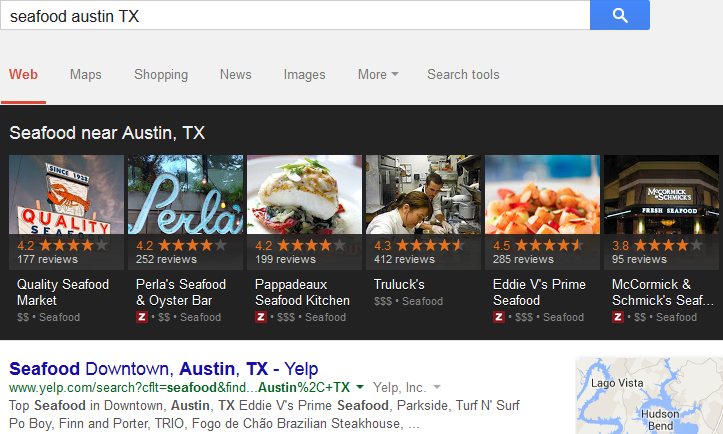 Sites like Yelp are a great way for not only getting reviews and publishing your company to the local public but these search results can also increase the visual real estate of the query result, meaning that your company shows up more than just once and is likely to be more prominent than your competitors. On the internet a citation is known as a mention of your business’s address, phone number and name, otherwise known as NAP for short. Often times these mentions will not have a link to your site but instead will just be a text entry. Even though these entries aren’t a link it is commonly believed that Google still treats these mentions as authoritative and thus you should make sure you are listed in your relevant directories. Data aggregators allow you to submit your information to their directory and they will in turn supply this data to the citation sites we just discussed, saving you the time of having to manually enter the information yourself. The four powerhouses that control this data are Localeze, Infogroup, Acxiom and Factual. Each of this aggregators update and confirm business data in their own ways. For example, Localeze uses geo-coded tags for latitude and longitude locations of businesses to create local listing information while Infogroup likes to make phone calls to businesses and personally make sure that the business details they have are correct. Once you have all of your citations squared away it is equally as important to track them to ensure that remain current and up to date. Citation Tracker is a tool that allows you to find the citations that your business already has. Additionally, you can use the tool to spy on your competitors to see where they are getting their citations from as well. 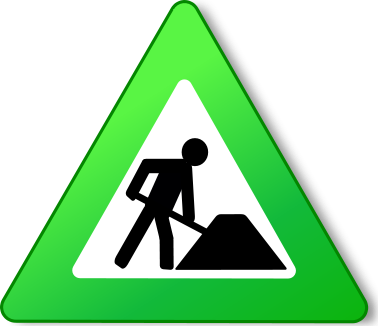 An important thing to remember when using citation tracker or other citation finding tools is to make sure that the NAP information matches with the NAP information you have provided to Google or other local listings. Often times mismatched information is not regarded as valuable and can easily be passed over by a search engine bot that is crawling the web for your information. As I mentioned before, review sites like Yelp and Oyster are not only great for getting your business out into the public spotlight with the help of your clients’ reviews but they are also great for increasing the real estate you get in organic search results. As seen to the left, by getting your company registered on the available public review networks you are able to effectively capture the entire search query result page, leaving no room for your competitors to even get their name in. Pretty cool, right? If you were in a super competitive industry with lots of local followings this strategy is an easy solution to knocking your competitors down a peg, leaving your brand’s name the only one customers will ever see. By sponsoring local events you improve your chances of getting other local resources to talk about you online, thus generating a natural link that is great for your website. Additionally, by helping out your community in general you can get other locals to talk about you online and making references to your website and all of the great things you have done to help out around town. Producing engaging content for your target audience can also aid in the effort to gain links for your website. People who find your content informative and fun to read will often link your page because they want to share the information with their friends and viewers, meaning that your website gets even more exposure. In turn, this also helps to beef up your local listing profile as links begin to trickle in and your listing becomes more authoritative. If you were the proprietor of a seafood restaurant you may write an article for a local publication regarding sustainable fishing and how your business helps contribute to this cause. Or, if you own a construction company you might write about the steps you take to use green building materials to help better the environment. These are just ideas of content pieces that can grab readers’ attention and get them to share the work with their friends, resulting in greater exposure for your company. The last thing we’re going to cover in this tutorial regards tracking your company’s rankings over time to ensure that you don’t drop out of the field. One thing that I can’t stress enough is that perfecting your local listing is not just a one-time deal. You have to occasionally check your rankings and determine if action is needed to ensure that you stay on top, or, if you have dropped down, devise a new plan to get you back to the top. There are many different ways you can go upon checking your rankings for different search terms. A more manual approach would involve typing in your perceived search queries into Google and visually checking how your company is ranking in the local listings. A second method would include using an SEO tool (there are many, many choices available and they all essentially do the same things) that automatically scrapes Google for your rankings and displays them to you in a report. With such a tool you can easily see any drops or bumps you get in your listing and adjust your plan accordingly. Take a minute to pat yourself on the back! By finishing this tutorial you are miles ahead of your competition! If you have any questions feel free to send us a tweet @techfunction and don’t be afraid to share this guide with your friends on social media, they may need a little guidance too!